Members had an excellent visit to Stoney Littleton on 17th June 2017. David Roberts led the walk and gave us a detailed history of the long barrow and went the extra mile by providing detailed notes. This is a brief summary of those notes. Long barrows were constructed as earthen or drystone mounds with flanking ditches and acted as funerary monuments during the Early and Middle Neolithic periods. They represent the burial places of Britain’s early farming communities and, as such, are amongst the oldest field monuments surviving visibly in the present landscape. Where investigated, long barrows appear to have been used for communal burial, often with only parts of the human remains having been selected for internment. It is probable that long barrows acted as important ritual sites for local communities over a considerable period. Some 500 long barrows are recorded in England. As one of the few type of Neolithic structures to survive as earthworks, and due to their comparative rarity, their considerable age and their longevity as a monument type, all long barrows are nationally important. Stoney Littleton is a Neolithic chambered barrow of the Cotswold Severn type. The defining characteristic of these barrows is their trapezoidal shape. Another common feature is a “forecourt area”. It is orientated NW-SE and is about 30m long, 2m high and 12.5m wide at its widest point. It is believed to have been formerly much higher. The internal arrangement comprises a passage, with three pairs of side chambers and an end chamber. The length of the passage is about 13m and the height varies from 1.2m to 1.8m. 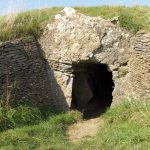 The first recorded opening of the barrow took place in about 1760 when the farmer, who owned the land, forced an entry through the roof to obtain stone for road mending. The barrow was excavated in 1816 by John Skinner, accompanied by his brother Russell, Sir Richard Colt Hoare and his steward and surveyor Philip Crocker and a labourer Zebedee Weston, who probably undertook the heavy work. From the west central side-chamber: fragments of earthenware vessel with burnt bones; bones of two or three skeletons. The mound was restored by T.R. Joliffe in 1858, and further work as carried out on the site in 1938 by the Ministry of Works. There were later surveys in 1989 and 1995. Excavation and conservation work took place in 1999 and 2000. 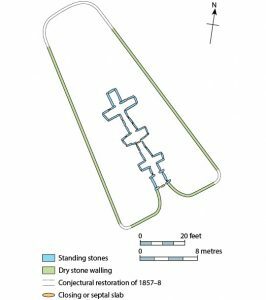 Despite erosion over time, excavation and reconstruction, Stoney Littleton long barrow survives well and is now subject to statutory protection. It is to the credit of English Heritage that the barrow remains accessible to the public. 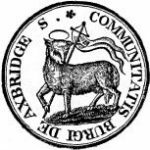 The report of the Annual meeting of SANHS in 1857 states that, by means of a pecuniary grant, the Society was instrumental in carrying out timely preservation of the monument. It is unclear whether this report relates to the Joliffe restoration or was additional.